5. Unfortunately, their strength and perceived insensitivity to pain lead to being exploited by humans and made to fight. 6. …which is heartbreaking once you realize violence is not in their nature but merely a trait taught to them. 7. Because pit bulls have been bred to be “fighting dogs,” they may require a little extra socialization and TLC during puppy-hood. 10. Let’s stop and talk about this hero who took a bullet for his owner. 23. But they’ll hang out with you just the same. 24. Many adoring pit bull owners assert that their dogs have a great sense of humor. And OMG a chick on his head? 28. 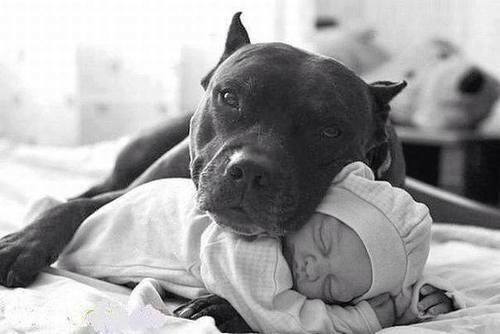 One of many examples of pit bulls taking part in inter-species friendship. 29. They’re actually extremely patient. 35. And give them the love they deserve. 36. Can we get one last “Awwww”?